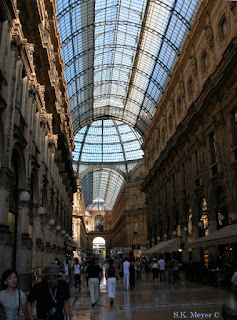 My Milan (Italy): It's June 2...what to do in Milan?! It's going to be a nice day, come on!, get up off the couch and out into the fresh air! ...Renaissance city hall, Palazzo Marino, once a private mansion that broke the mighty coffer of its builder, offers rooms newly open to the public. From 10 A.M. to 8 P.M., it will be possible to go (you might have to stand in line, let the visitor beware). Where? Piazza della Scala. The line for the mansion looks a bit too long? Then try the one for the mid to late 19th century multi-use complex (and you thought malls were inventions of our own day! Heck, there were already shopping streets with covered porticoes as far back at least as the ancient Roman empire...even in Milan! ), the Galleria Vittorio Emanuele. Very recently, the upper catwalks have been opened to the general public. 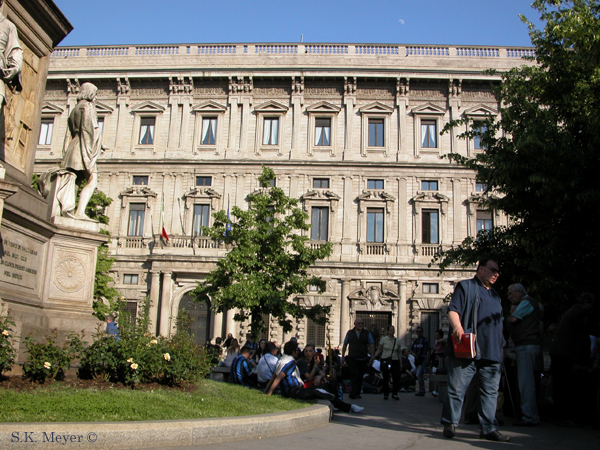 The entrance is at via Silvio Pellico 6 on the other side of the Galleria from the Piazza della Scala. Hours? From 10 A.M. 'til 6 P.M., groups of 25 will leave on the half hour. These visits, though not with these hours, will continue to be available. Stay tuned! What could be a better way to spend time with the family: beauty, history and (hopefully!) good company, all rolled up into one! Enjoy! And Happy Birthday, Italy!